Creating an anti-aging skincare routine isn’t all that hard. If you keep a few key things in mind you’ll help your skin look great now and into the future. Think the early twenties is too soon to see signs of aging skin? Dermatologists see them commonly. “The earliest signs of aging really start around the eyes. You can start to see some fine lines, and then on the face in general, some broken blood vessels and sun spots,” says Doris Day, MD, a dermatologist in private practice in New York City and clinical assistant professor of dermatology at New York University Medical Center. Typically, the more sun exposure, the greater the damage, she says. Fortunately, the twenties and thirties are also prime decades for women to learn how to counter sun damage and other factors that age the skin, says Heidi Waldorf, MD, an associate clinical professor of dermatology at the Mount Sinai School of Medicine. She is also director of laser and cosmetic dermatology at the Mount Sinai Medical Center. “What you do for your skin or against your skin will have ramifications as you age,” she says. First, younger women must understand the pitfalls. For instance, Waldorf sees many who still embrace tanning. Often, they wrongly believe that skin aging is something to worry about down the road, not in their youth, Waldorf says. Another common habit that damages young skin: smoking. Use sunscreen daily, even when it is overcast outside. When spending the day outside wear a hat and sunglasses, and reapply sunscreen every 2 to 3 hours when spending the day outdoors. Don’t forget that you get lots and lots of sun exposure even when you are going about your normal daily activities like driving, walking around the neighborhood, sitting by a window, and running errands. Don’t smoke – smoking ruins your skin is so many ways. See my post below for more information about smoking and your skin. Maintain a healthy lifestyle – exercise, practice relaxation techniques, and eat right. When you take good care of yourself it shows in your skin. Use skincare products with antioxidants in them to protect your skin from pollution, free radicals, and the sun. Use a retinol or prescription Retin-A skincare product starting in your 30s in order to correct skin damage, smooth your skin, build collagen, and treat acne (if you need to). In the quest to look younger many women turn to surgery, skincare products, and injections. I’m all for looking your best because when you feel that you look good those positive feelings radiate out into the rest of your life. The traditional Western ways to stay looking young involve injectable fillers, Botox, and even cosmetic surgery but it turns out that there are other ways to look younger such as trying facial acupuncture. Personally, I am a very strong believer in acupuncture. I have been going regularly to an acupuncturist for over a year and a half and love it. I love acupuncture because it helps me with stress relief, PMS relief, and overall well-being. Also acupuncture treats the body as a whole and does not separate emotional wellbeing from physical wellbeing. I think a holistic outlook on health, including skincare health and beauty, is important. 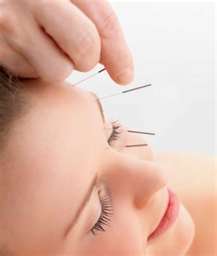 Traditional acupuncture is an ancient Chinese form of natural medicine that dates back approximately 5,000 years. It has developed from careful observation of the workings of the body and how the environment affects it. The principle behind the medicine is to view and treat the body, mind and emotions as a single unit, working on the cause of the illness, not the symptoms. In many countries it is a primary form of health care; in the hospitals in China it is used directly alongside Western Medicine. Here is a simple analogy to get a basic understanding of how our body is viewed in Chinese Medicine: Think of the body as a complex system of water pipes which need to be in good health for everything to work smoothly. When a blockage develops in a pipe somewhere it affects the workings of the entire system and generates symptoms. This is akin to what happens when an injury or disease affects our body. These “pipes” which run all over our body are called meridians. The “water” which flows through them is named Qi (Chi). The Chinese mapped out these meridians over the course of almost a thousand years. By inserting a needle into specific points along these pathways, the blockages can be removed and harmony returned to the body. Whilst several research studies are being performed to explain how Acupuncture works in a Western Medical Framework, these scientists have not yet been able to explain how it works exactly; however, they have provided solid evidence that acupuncture does in fact work very well. … a safe, painless and effective treatment for renewing the face as well as the whole body. 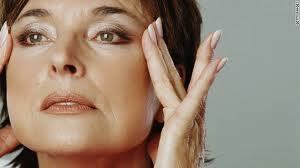 Fine lines may be entirely erased, deeper lines reduced and bags around neck and eyes firmed. Cost of the treatments varies widely according to who you go to and where you live, but overall investing in this treatment could be less costly in the end than getting surgery or regular fillers and Botox (or both). Rhoda Narins, MD, president of the American Society for Dermatologic Surgery, says she thinks acupuncture has its place, especially as a pain reliever. But she doesn’t believe in it as a replacement for cosmetic treatments such as surgery, Botox injections, and the like. “Acupuncture doesn’t stop the muscle movement that creates lines,” she says. “Botox does.” Nor can acupuncture tighten or “fill” the skin as surgery or injectable fillers such as Restylane can. If you feel that you want to try facial acupuncture you can find an acupuncturist through Mary Elizabeth Wakefield’s referral list.